Wii Fit Trainer has returned for Super Smash Bros Ultimate. There have been several tweaks and changes since their last appearance, so players will need to study up and get to grips with the new features in order to get up to speed. To help you out, we’ve put together this Super Smash Bros Ultimate Wii Fit Trainer Guide. It covers the changes that have been made since their last appearance, and there will also be info on the Wii Fit Final Smash, and the Alternate Costumes that players can choose from. Wii Fit Trainer last appeared in SSB4, and has been a cult hit ever since. 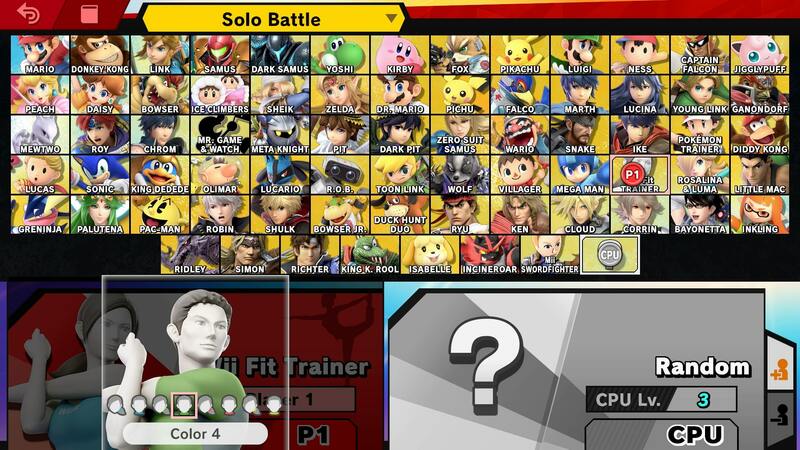 There has been several changes since then though, as all characters have been rebalanced for Super Smash Bros Ultimate. We’ve listed all of the key info below. Just when you thought Super Smash Bros. Ultimate couldn’t get any weirder, along comes the Wii Fit Trainer as a fighter. Just below, you can see a table featuring the entire moveset of the Wii Fit Trainer in the game. There have been some subtle changes to Wii Fit Trainer since they appeared last. This includes alterations to animations, moveset changes, and even some improvements to damage output and speed. We’ve listed all of the changes we’ve noticed below. Several animations have been tweaked including jumpsquat, header, Neutral Attack, and Wii Fit. Final Smash has been altered slightly, more on that later. The lens glare effect has been removed from Sun Salutation. Wii Fit Trainer uses the same Final Smash as in SSB4 this time around. It’s called Wii Fit, and there have been a few minor visual changes. The move now has the potential to KO opponents. That’s all the details we know about Wii Fit Trainer in Super Smash Bros Ultimate. We’ll be updating this guide with more details as we get them. For more info on other aspects of Super Smash Bros Ultimate, head over to our Super Smash Bros. Ultimate Guides hub. There’s trailers, a look at the Ridley amiibo, and more.